My first podcast is ready to be listened to! Topics are the Calming Signals of Horses, Using Enriched Environments and doing Scentwork with horses. It was wonderful and exciting to be doing a podcast. I was lucky to have Tracy Malone as host. 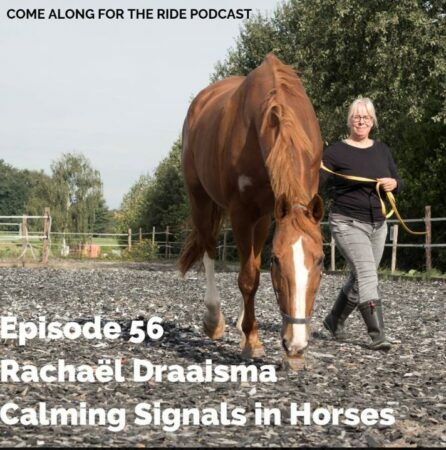 She has already interviewed so many interesting horse people for her podcasts “Come Along For the Ride”, that I was in safe and capable hands. Such a help and joy. Do you feel like listening? If you click on the picture or the following link you will find yourself directed to the podcast. https://comealongfortheride.com.au/episodes/ Enjoy! 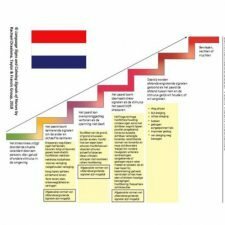 I took a bit, but here they are: two communication ladders in Dutch. 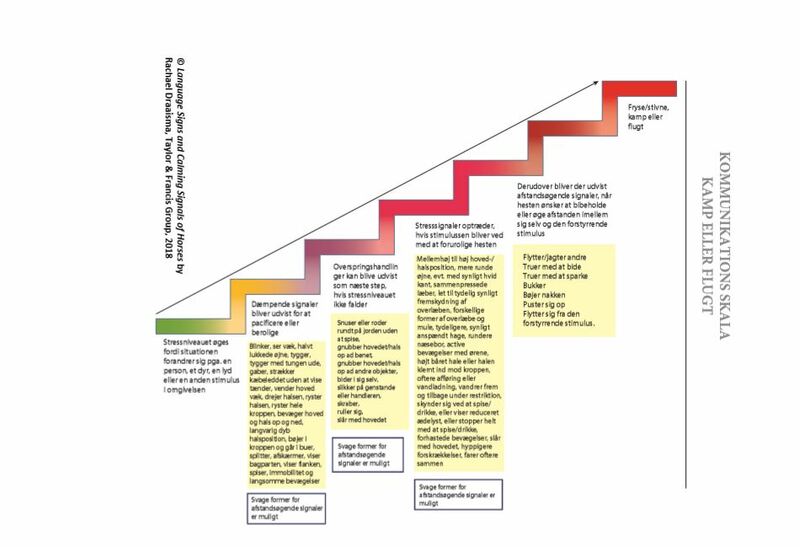 You can download them copy right free from: https://calmingsignalsofhorses.com/downloadpage/ It is not allowed to change the ladders. 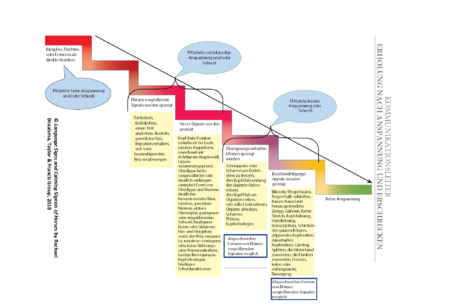 The two communication ladders resulted from the ongoing study I started in 2013. 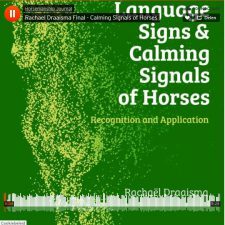 More information about the study and the ladders are given in the book “Language Signs and Calming Signals of Horses”. You can also find some information on the download page. 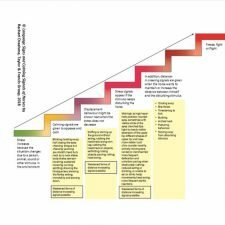 Do you want to see how the signals come to live? Visit one of my lectures. Watching film material of interacting horses is the main activity. 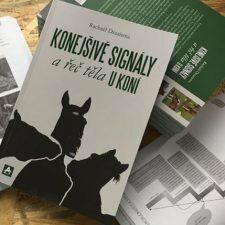 A couple of months ago my book Language Signs and Calming Signals of Horses has been translated in to the Czech language and has been published by Arcaro in the Czech Republic. The largest publishing house in horse books in the Czech Republic. Due to the number of sales my book hit the first spot in the top 10 best selling books! That is so special. Thank you Arcaro publishing and ofcourse the many buyers. I am so happy that the calming signals are finding a way into your life’s with horses. I am very looking forward to come. 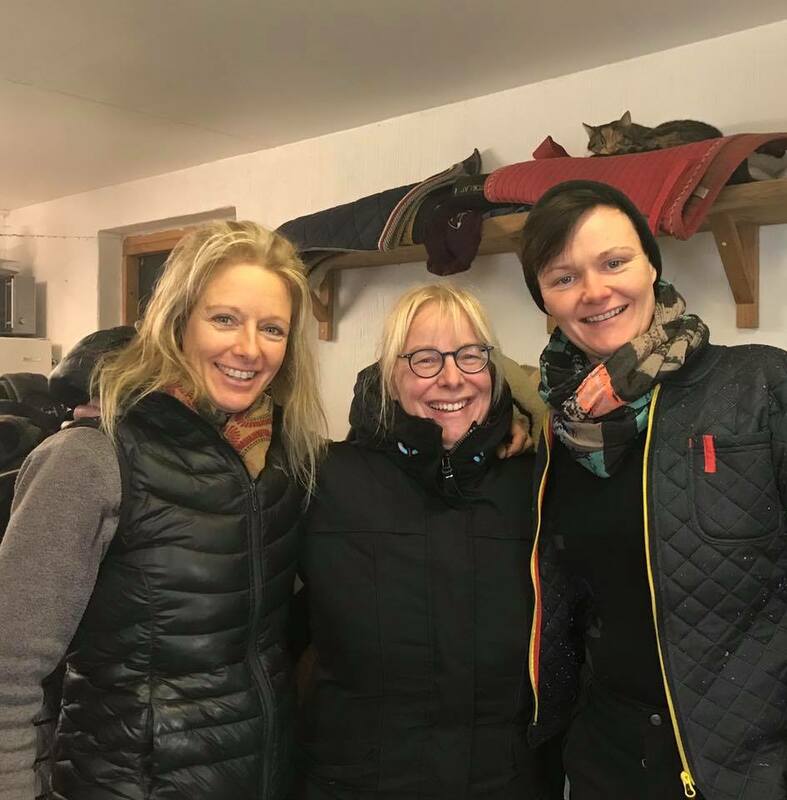 Ute Lehmann has been engaged fulltime in teaching and improving communication skills between humans and horses since 1996. She offers clinics and workshops in Denmark, Sweden, Norway and Germany, talking fluently Danish, English and German. Her work is based on friendly, reasonable communication and problem solving through wisely planned set ups. All students and equines are welcome and all lessons are given on an individual level. 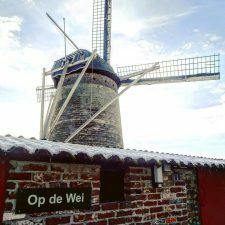 Ute has published the books ‘In Harmoni med Hesten’ and ‘Kunsten at ride uden bid’ in Danish language and ‘Reiten ohne Gebiss’ in German language. at Downloads In the chapter down loads you can also find background information and tips . 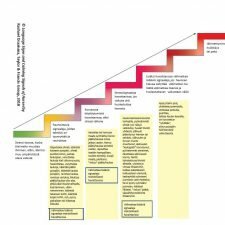 Do you want to know more about Iris Starnberger, PhD? She is based in Vienna, Austria. She is a zoologist specializing in signal evolution and multimodal communication and a certified animal trainer and behaviour consultant using science-based and animal-friendly methods. Iris gives private lessons and talks and is available for clinics in Austria and abroad. She is especially interested in medical training, gymnastic work for horses and in resolving problematic behaviour. Thank you, Iris! 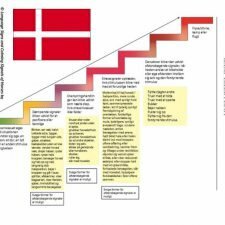 Coming up soon: the Danish ladders, translated by Ute Lehmann. 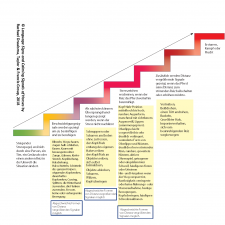 With a big thank you to Susanna Hämäläinen and Nina Mäki-Kihniä for your efforts and perfectionism to find the exact right Finnish words, and ofcourse my publisher CRC Press, two of my communication ladders are translated into Finnish. 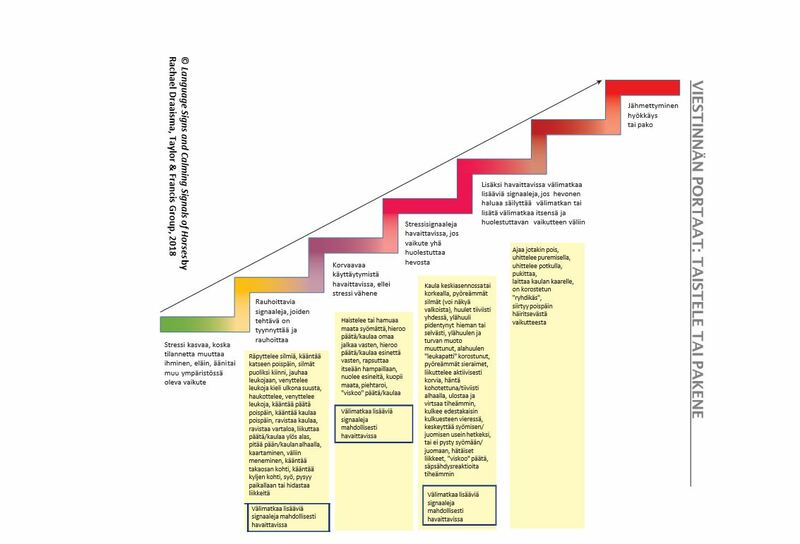 The two communication ladders are ‘Fight-Flight’ and ‘Recovery after Tension and Shock’. You can find them at sub header Downloads and download them for free. In the chapter down loads you can also find background information and tips. 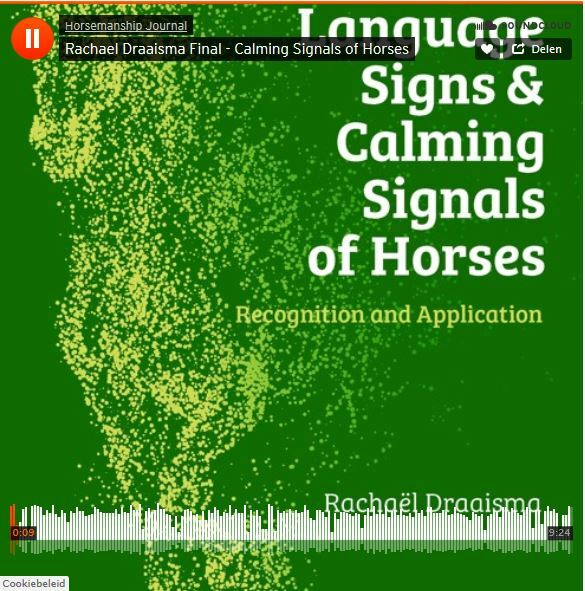 Thank you Suzanne Rogers from Learning about animals for inviting me to lecture on Calming signals and language signs of horses and equine mental stimulation and scentwork. 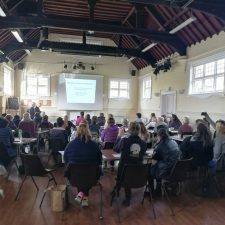 It was exciting to be able to share my findings on equine scentwork. What a great audience. I loved your enthusiasm and eagerness to learn. 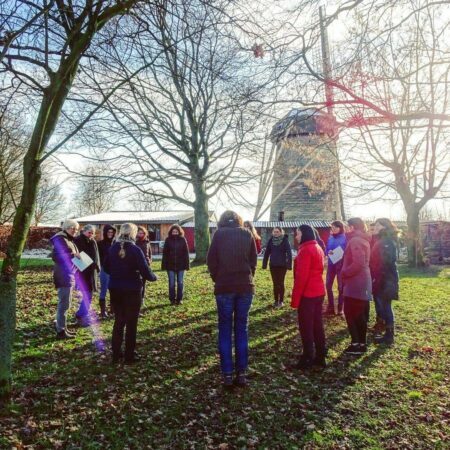 I feel so privileged being able to share the knowledge of my study, meet people and travel. 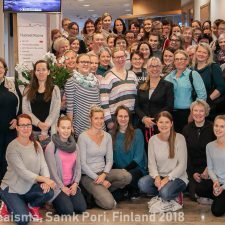 Last weekend was no exception to that, when I was invited to lecture at Pori Finland. Initiator was Susanna Hämäläinen, organiser was Satakunta University of Applied Sciences (SAMK University) by Hanna Tuominen. 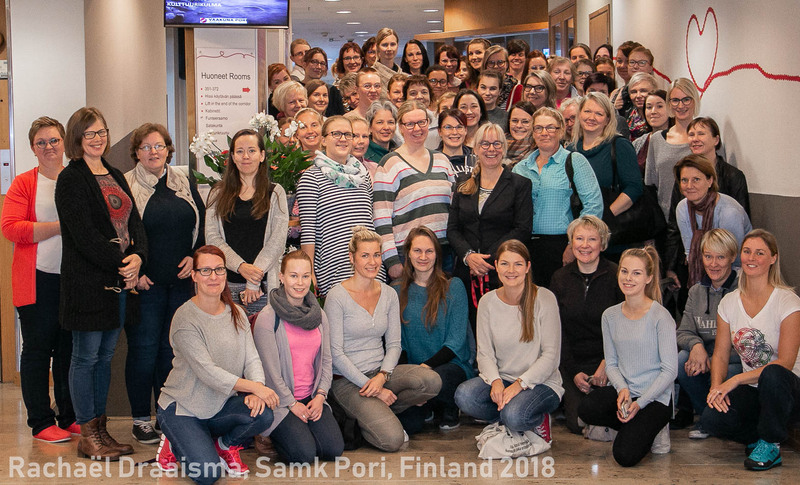 The audience consisted of a large group of veterinarian physiotherapists from SAMK University, a group of people who were very familiar with the calming signals of horses, having been taught them by Susanna Hämäläinen. There were teachers (also from institutes), behaviour consultants, horse owners. 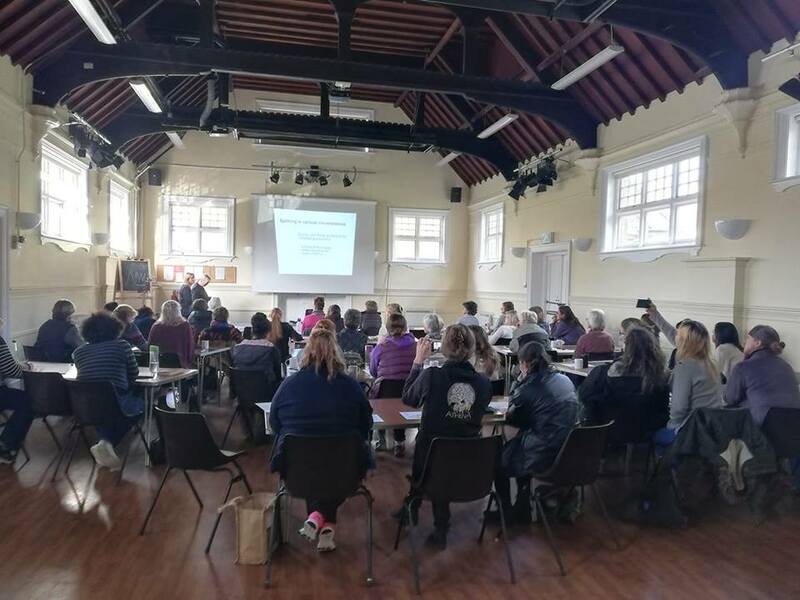 But above all, there were all horse lovers who are actively involved in finding new ways to improve their relationship, socialisation, communication and training of horses. There were a lot of indebt questions and great observations. And above all a great vibe. 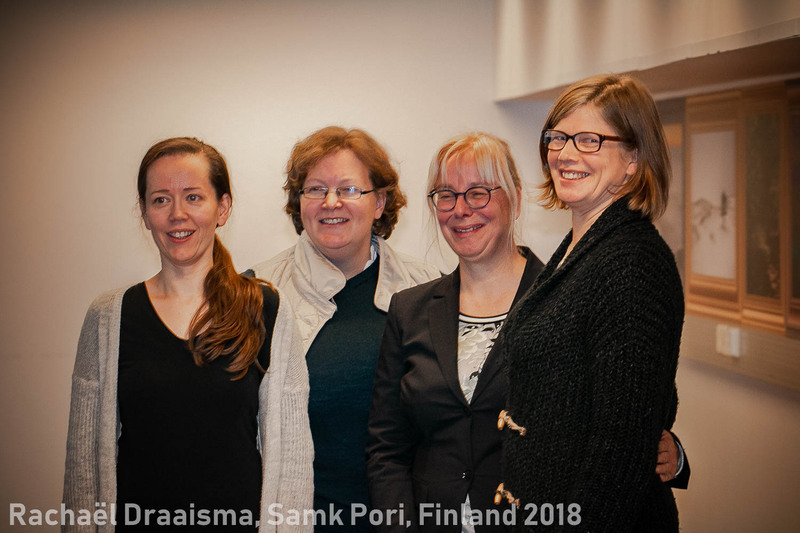 A very nice other personal touch for me was meeting Susanna Hämäläinen, Nina Mäki-Kihnia and Hanna Tuominen, persons I have been mailing with and working with for months and who I got to meet real life for the first time. What a joy. Thank you so much Hanna Tuominen from Satakunta University of Applied Sciences for the perfect organisation. Thank you Rita Peltola and Virpi Tunninen for taking pictures. 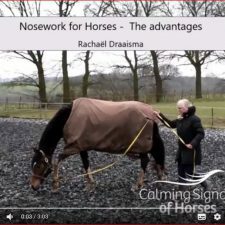 Enclosed my first Vlog on the advantages of doing Nosework with Horses. Starring Indy, in her 7th session to follow a scent trail and to find a hidden bag of food. 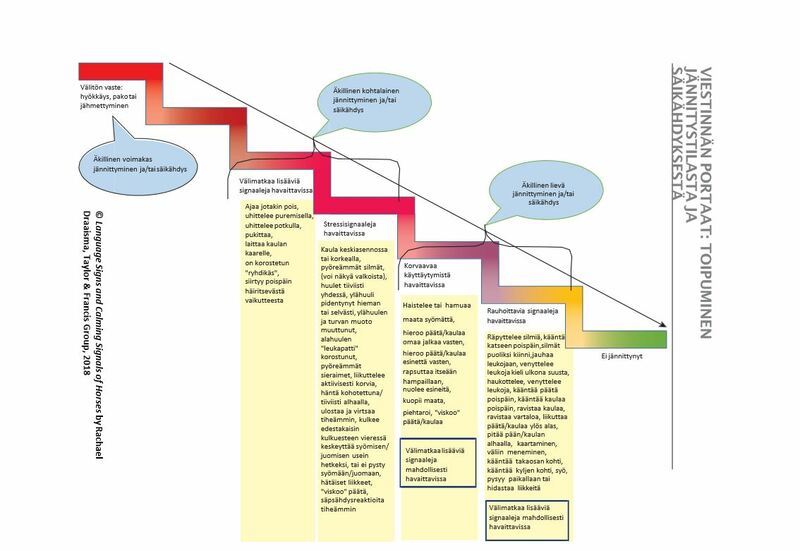 Do you want to reproduce and use my communication ladders? You can now download two of them for free from my site. 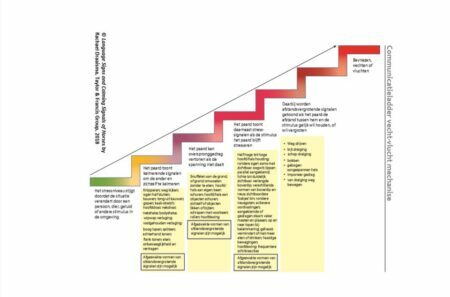 These are the communication ladders ‘Fight-Flight’ and ‘Recovery after Tension and Shock’.Just go to the sub header Downloads. 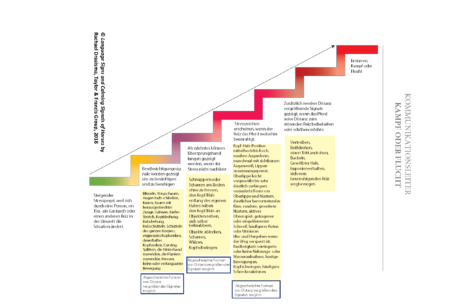 There you will also find some background information and tips on the usage of the ladders. Available now is English. The languages Dutch, Polish, Swedish, Finnish and Slovak are in the making and will be added soon. 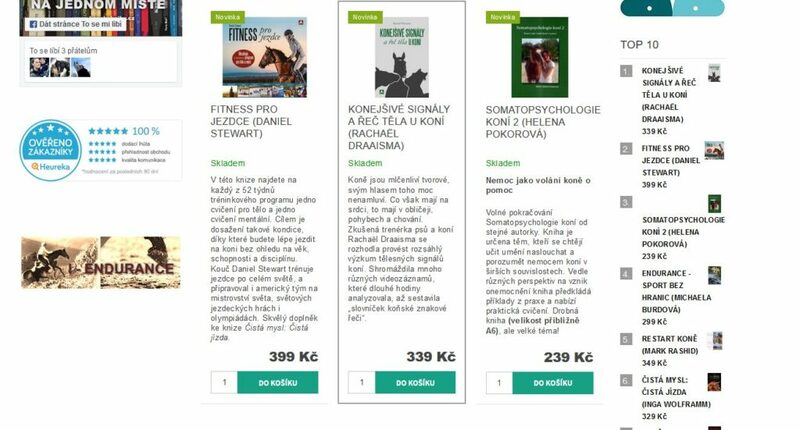 With gratitude towards the publisher (Alice Oven) and translators: Ewa Rumistrzewicz (Polish) , Angelica Hesselius (Swedish), Venya Kršňa (Slovak) and Nina Mäki-Kihniä and Susanna Hämäläinen (Finnish).